This two-transistor white noise generator has a surprising feature – about 30dB more noise than the more traditional designs. Q1 and Q2 can be any small-signal transistors with a beta of up to 400. The reverse-biased emitter-base junction of Q1 provides the noise source, which is fed into the base of Q2. 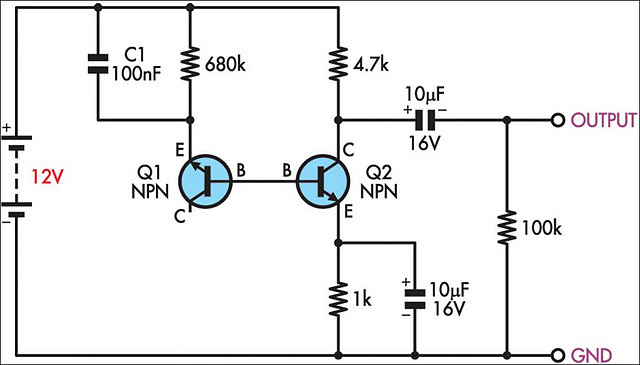 Q2 forms a simple amplifier with a gain of 45dB. The improved output level is due mainly to the inclusion of C1, which provides a low-impedance AC source to the noise source while not disturbing the DC bias of Q1. The low amount of feedback also makes this circuit very resistant to oscillations and tolerant to circuit layout. Unfortunately, the truism of "no such thing as free lunch" also applies; C1 makes the circuit very sensitive to power supply ripple.